Our official North Carolina summer drink experiment is well underway and we've uncorked (or unsealed, since they're in canning jars, not bottles) four of our infused alcohols and they are tasty. 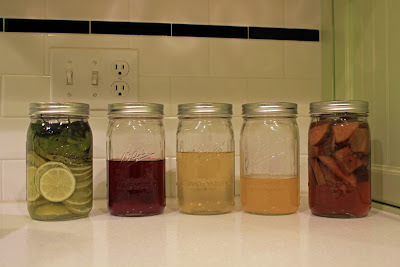 From left to right: Lime-basil vodka, blackberry gin, jalapeno vodka, grapefruit vodka, apple bourbon (not pictured: black pepper vodka). Let's start with the ones we opened, they include blackberry gin, black pepper vodka, jalapeno vodka and grapefruit vodka. I was the most excited by the prospects of the blackberry gin and two spicy vodkas and none of them disappointed. The blackberries (which Lauren and I picked ourselves at Lewis Farms here in Wilmington) really gave up a lot of color - as you can see from the picture - and flavor. I was worried that the juniper-heavy gin would overpower the blackberry, but it didn't; in fact, they compliment one another quite well and what we ended up with is a (very) purple, slightly sweet, slightly ginny and remarkably smooth-sipping drink. At first I thought I'd have to mix the gin, but this is great neat and with a little soda. Even though I hate it when I see bars do it, I may have to try a blackberry martini. The black pepper and jalapeno vodkas are spicy. I mean really spicy. To make the black pepper vodka, I put two dozen whole black peppercorns in a small bottle (200 ml) for a week. For the jalapeno, I sliced up six or seven peppers and put them, seeds and all, in the jar. These are not for drinking straight up but are perfect for making mixed drinks. I had a black pepper Bloody Mary on Sunday and it was awesome. The pepper really set off the spices in the drink and I was pretty happy. I haven't yet made anything with the jalapeno vodka. The most popular of the alcohols is the grapefruit vodka. It was easy to make (cram a sliced grapefruit in the jar and cover it) but next time I'd do some things differently. For starters, I'd cut away some of the pith (the white stuff between the rind and fruit) and add some other citrus fruit that's a touch sweeter, like an orange. Second, I'd dump the fruit about five days into the process and replace it with new fruit. That being said, it's deeeeeeelish. Especially with a little soda. And even more especially with some lemonade. That's been the house drink for a few days. As you can see from the picture, we need to make more. As for the bourbon, I gave it a quick taste and not much had happened. I added Granny Smith apples, thinking their tartness would help mellow out the sharpness of the bourbon, but not so much just yet. I'm adding a cinnamon stick and some new apples in a day or two, then giving it some more time to infuse. We just put the lime-basil vodka in the jar, but already the vodka is taking on a green tint, so we know it's taking on a lot of flavor. In a day or two I'll taste it and change out the basil or lime as needed. The best thing about these infused alcohols is that they're incredibly easy to make. We just cut up our infuser, stuffed it in a jar, covered it with liquor and put it in a cool, dark cabinet for a week. Turns out, that's just enough time for the blackberry gin and grapefruit vodka and a little too long on the black pepper and jalapeno vodkas. This whole project is exciting and fun. I'm looking forward to steeping some Good Earth tea in vodka and making a Drunken Palmer with the tea-infused and grapefruit vodka. I've also been thinking about other things to do - vanilla bourbon, coconut-vanilla vodka (we got that one from a friend), habanero gin, sour cherry bourbon - to make this summer a refreshing one.